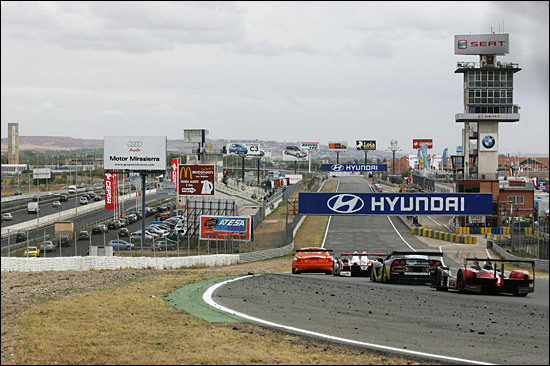 The final round of the 2006 Le Mans Series took place at Jarama, just 35 kilometres from the Spanish capital, Madrid. This race was a stop gap measure following the late cancellation of a planned September round at the historic Monza circuit. 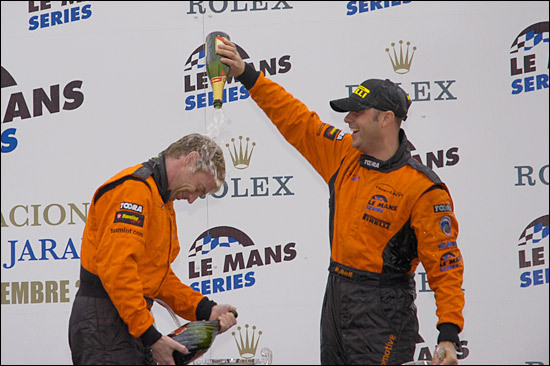 There was a great deal at stake at this last race of the European season, not just a race win but the second place in the Championship for the hugely competitive GT2 class, and with it an automatic entry for the 2007 Le Mans 24 Hours. That would sit nicely alongside the entry already earned by the team, after LNT’s historic win at this season’s 24 Hours. Jarama was once a Formula One circuit, but its last Grand Prix was held in 1981 where Canadian genius Gilles Villeneuve held off all comers in a powerful but ill-handling Ferrari. The circuit layout has been little changed since then - and neither it seems have the circuit’s facilities. Team LNT though had at least got the advantage of having tested at the circuit. The availability of a great deal of data was the good news. The bad news was that much of that data told a worrying story, that the basic layout of the Esperante was possibly less suited to the circuit than its main competitors. It would be a tough weekend for the crews of the #81 and #82 cars. Throughout the practice sessions on Friday and Saturday the task at hand was to find the best possible balance for the car over the race distance ahead. Reliability though has been a major strongpoint for the Team LNT attack and both driver squads expressed complete faith with their support crews. “Keeping out of trouble,” was looking set to be a real challenge on the narrow and twisty track, where the big LMP and GT1 cars had a massive speed advantage and would be eager to get by at almost any cost. It’s a recipe that has reaped rewards all season and despite the slightly downbeat assessment of the Esperante’s Jarama pace, it was undoubtedly the strongest hand available to Team LNT once again. Use the practice sessions to establish the best race pace available and stick to it, pushing a little harder perhaps when the opportunity arises. That analysis always makes the 20 minute qualifying session something of a dilemma. Racing drivers always want to drive as fast as they can, but the real game is to conserve the car and the tyres for the fray ahead. So a conservative approach to the session was in order and the Esperantes would therefore start the race from 9th and 11th in class - but with their Pirellis in better shape for the start of the race than the more hard-pressed rubber of several runners ahead. There was then just one remaining chance for the Team LNT boys to assess their ultimate pace against the rest, in the race morning warm-up, and there was immediate evidence that the two days of preparation had borne fruit, a late run from Rob Bell netting the second fastest GT2 time of the session. The 1000km of Jarama marked a near faultless run from both Panozes, beginning with both Rob Bell in #81 and Richard Dean in #82 making early progress up through the order. After just a couple of laps Bell had the #81 car up to 5th in class and well amongst the leading group, with Dean following through, up to 8th after claiming the scalp of Christophe Bouchut in the very rapid IMSA Performance Porsche. As the hour mark passed Bell was up to fourth, but he wasn’t done yet and progressed up to third place after a spin from Tim Sugden, before the first routine stops began: the careful build-up to the race was already paying big dividends. Indeed, as the leaders pitted Rob Bell was able to play another of the Esperante’s strong hands, the relative fuel economy of the Panoz over the Porsches and Ferraris meaning that #81 would lead the class before having to pit himself a lap or two later. Dean too had a moment of glory as he too had a chance to display the extraordinary fuel mileage of the big 5 litre V8 #82 Esperante, He took the car up to second in class before he too needed to pit. Warren Hughes would rejoin the race in a strong second in class, the Team LNT crew turning the car around in fine style and enabling the car to grab another place still, a position consolidated when the #76 Autorlando Porschge was forced into retirement with a broken gearbox. In #82 Lawrence Tomlinson was now aboard and he was beginning to make his way back up the order too, passing the Virgo Ferrari after it was tagged by a faster car and then humbling Gunnar Kristensen in a factory-backed Autorlando Porsche, which had been quick all weekend. The Team LNT boss was on the move. For Hughes though the race was on for a win. 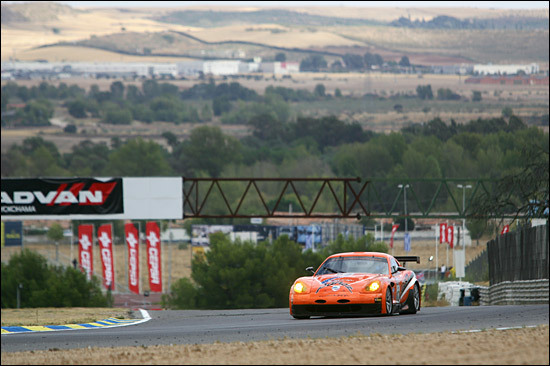 Ahead was the #97 GPC Ferrari, the rapid Luca Drudi aboard with Hughes pushing hard to stay in touch with the 430. 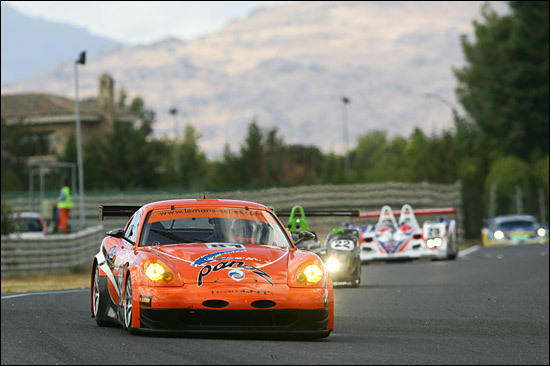 At the two hour mark both leading GT2 cars were in the top 20 overall. 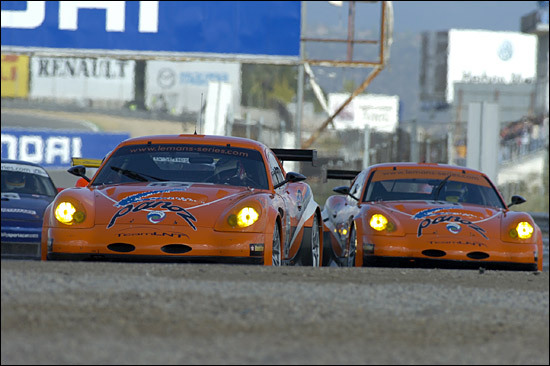 The Panoz was by now holding off the fastest remaining Porsche behind but, after drawing very close indeed to the Ferrari ahead, began to find the pace putting the race strategy at risk. Team LNT has found both at Donington Park and at Le Mans that the slightly more conservative pace can pay dividends in endurance racing. Could it work once again? After the next routine stop it was Marc Hynes’ turn to take the wheel of #82, the car now up to 6th in class, and Hynes was immediately on the hunt for more progress, closing in on the Virgo Ferrari 430. His pursuit of Tim Sugden was settled with a mistake from the Yorkshireman, which saw the #99 car into the barrier at the final turn. Into the final stint of the race and Warren Hughes stayed aboard the #81 car with Richard Dean climbing back aboard #82. By now the GPC Ferrari had made good its escape. Hughes though was comfortably holding off the rapid Dane Allan Simonsen’s Porsche. Dean was in very fast cruise mode and rumbling home fifth in class. It would stay that way until the end of the race, but despite the podium, the champagne and the press conference featuring a very happy GPC Ferrari squad, there were rumblings along the pitlane. Several teams had noted that GPC’s star driver Fabrizio de Simone had been in the car for a very substantial chunk of the 6 hour race distance, any one driver having a maximum allowed time, under the rules, of four hours at the wheel. For now though it was time for Warren Hughes and Rob Bell to reflect on a highly satisfactory result. Warren Hughes: “We ran trouble-free and the decision to go for the harder Pirellis was definitely the right call. Right through the race it seemed that the drop-off in pace as the tyres wore down compared very well indeed with all the rest. “Of course second place is quite frustrating but if you’d offered us this result at the start of the weekend we’d have grabbed it with both hands. “It took some doing but we found a really good set-up for the car, it’s just a shame that we didn’t get more luck at the start of the season. Rob Bell: “The race was hard work coming up through the pack but in the last couple of races the car and the whole team have really clicked. For the #82 crew there was frustration that their race finish had left them just short of second place in the GT2 Championship and with it an automatic entry to the 2007 Le Mans 24 hours, to sit alongside the one already earned for their historic class win in this years classic, hugely valuable to the team both in terms of prestige and commercially. The race meeting wasn’t over yet though. The suspicions of the observant eyes in the pitlane proved correct. The winning car’s star turn had indeed exceeded his maximum permitted time at the wheel. 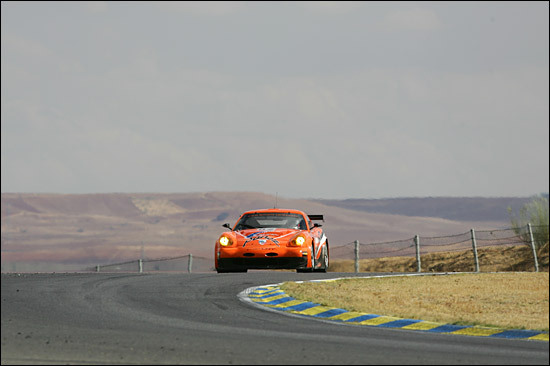 The #97 Ferrari was disqualified, Team LNT’s #81 Panoz was therefore promoted to its second consecutive race win, with the sister #82 car inheriting 4th. A race win and of course the second place in the GT2 championship for Team LNT were the most significant results of the Italian team’s blunder. “I’m relieved more than anything,” said a tired Richard Dean, as the revised result was confirmed by the race stewards at 21:30, over three hours after the race had finished. What a year 2006 has been for Team LNT. 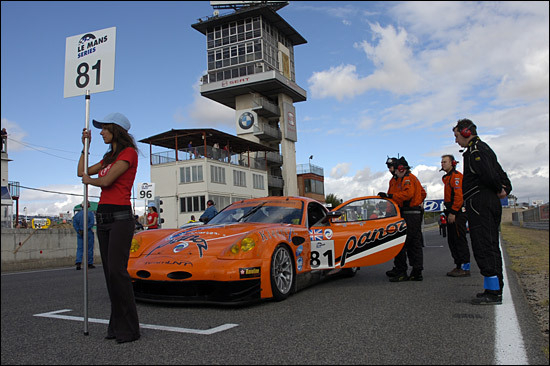 As the European agents for the American Panoz marque the team had chosen a difficult path, going head to head with the European GT elite, Porsche and Ferrari. 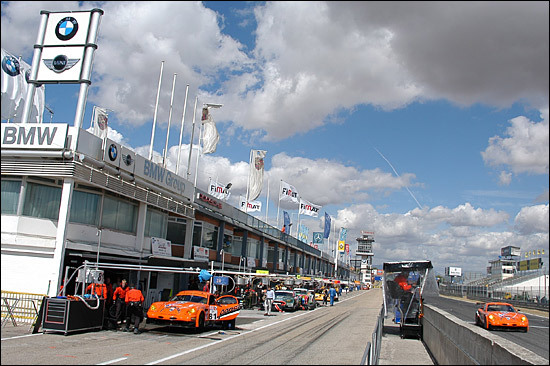 By the end of the Jarama 1000km race, the fifth and final round in the Le Mans Series, the pair of Team LNT cars had scored a pair of wins and a further pair of appearances on the podium. 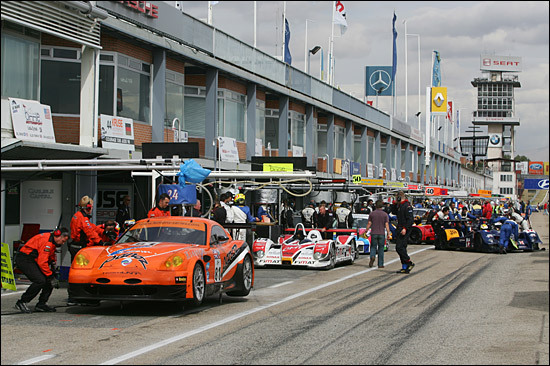 Indeed the orange cars from cars from Braselton, Georgia, via Sheffield, have been on the podium at all but one of the European races they have contested. 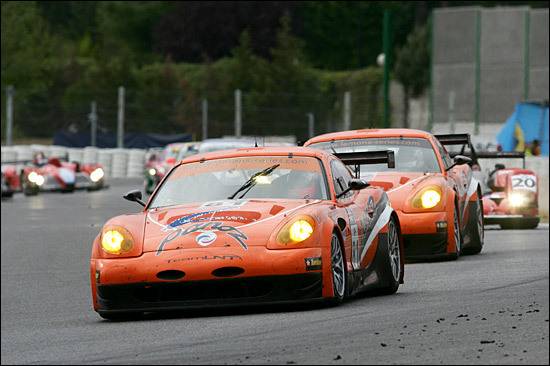 To top it all too there was the famous class victory at Le Mans, the first team ever to humble Porsche in the GT2 class. 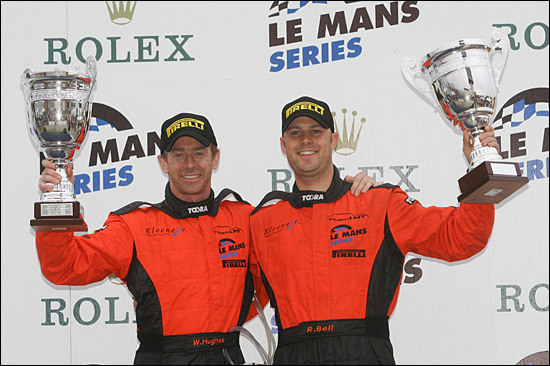 There is indeed a great deal for Lawrence Tomlinson, Richard Dean and their men in orange to look back and reflect upon after the 2006 season – and two entries to look forward to at Le Mans 2007.